Sourdough Surprises April 2013: Sourdough Pasta. The Sourdough Surprises challenge this month was pasta. I have to confess that while I have tried a whole lot of sourdough things, I have never considered adding starter to pasta before this challenge. Sourdough starter really makes good pasta. I let my pasta ferment at room temperature for a full 7 or 8 hours, ensuring it was a truly fermented food. By the end of that time frame however, it was late afternoon when I started rolling it through my Pasta Queen; I hadn't planned a meal around fresh noodles. 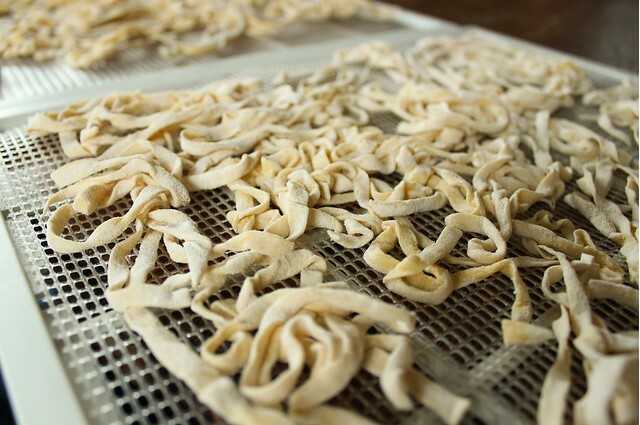 I rolled them to the level 6 (of 7 levels) thickness, then tossed them in plenty of flour, as my Mom does when cutting rustic soup noodles... then I decided to dehydrate them for using another day. 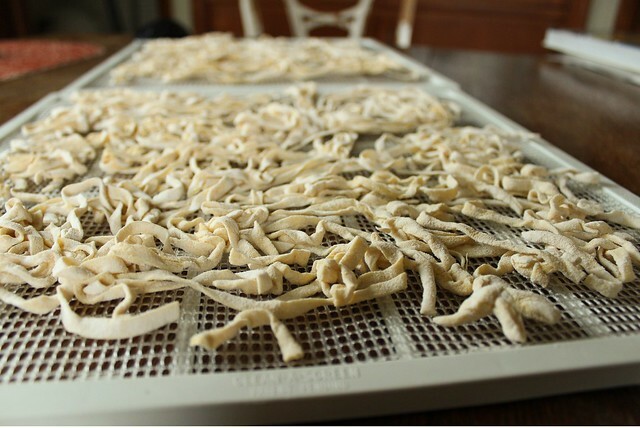 I only recently discovered drying out pasta in the dehydrator, and it really works well. My only problem is that I need to keep my dehydrator in the basement for space reasons, and in addition to sometimes several trips up and down the stairs with loaded screens, sometimes I forget that I've left something in there for days after the drying has finished. Not so much a problem I guess, but this pasta I forgot about for about a week before the Sourdough Surprises Facebook page posted a challenge reminder! Then, I carefully brought my screens up and packed the fully dried noodles into jars. They were more fragile than traditional noodles I've made, but when I boiled some quickly (as in fully cooked in three minutes) they were delicious and tender. Maybe tender to the point of nearly falling apart... but that could have something to do with the dehydration. Next time, I'll mix up pasta early in the morning and cook it fresh for comparison. My boys devoured my sourdough noodles, which I only buttered and salt-and-peppered. 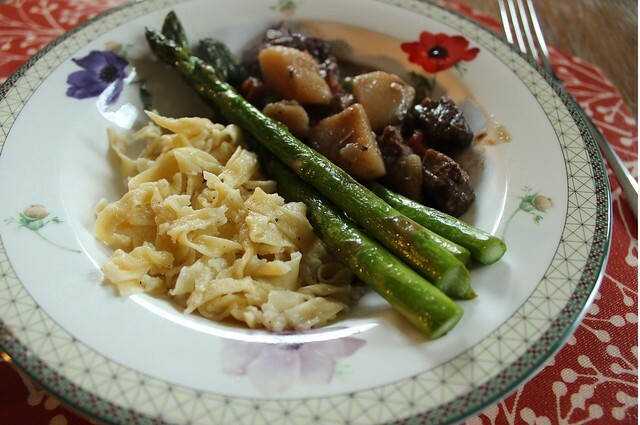 It was the fastest meal ever, since I pulled some frozen beef stew from the freezer and pan fried some finally here spring asparagus. It really had a marvelous texture, despite being robbed of some looks. I was very happy to be challenged to make pasta this month - and I can't wait to see some of the pastas that others have made. I certainly want to try some stuffed pastas when I remember to allow more time, and I know this isn't the end of my sourdough pasta-making!